Are you self-employed and looking to improve your vehicle in order to work more efficiently? Store Van converts any make commercial van into a real mobile workshop on wheels thanks to the experience and competence gained over the years as a van interior fittings manufacturer. 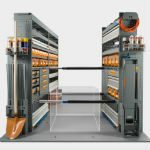 and provide storage for your work material and spare parts. Browse through our solutions by make, or through our products, to get an idea of what could work for you. Our designers will then create a mobile workshop solution tailored to your specific needs. Our Store Van floor coverings, with TÜV-certified friction coefficient are the perfect solution to protect your van’s floor. The marine plywood used has a thickness of 9 or 12 mm and is coated with a phenolic film that makes it extremely resistant against impacts and heavy loads. The flooring is rounded off with a patented aluminium profile joining system. We also offer modular raised floors with under-floor drawers and shelving, ideal for small and medium-sized vans. 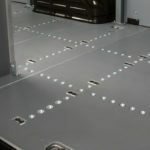 Our flooring products are very carefully finished and, like all our commercial vehicle fittings, they comply with load safety fittings regulations. 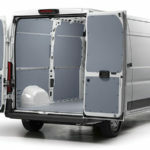 Our van interior coverings by Store Van are built to protect the bodywork of your van. Made with first-rate polypropylene honeycomb sheets, they offer an exact fit for your vehicle, providing adequate protection over the entire surface. The panels are installed using a special system that enables them to adapt to the van’s shape, compensating for any thermal expansion. Flexible, lightweight, washable, recyclable and, most of all, impact-resistant, they are guaranteed to keep your van in top condition for years to come! To put an end to the confusion and clutter in your van’s interior cargo space, you can count on our van shelving solutions, real benefit multipliers: from safe, quick and clean storage of tools, equipment and tool carry cases on shelves, drawer units and shelving, to operational support with work benches and a vast range of accessories, all the way to the storage of small parts, which you’ll find easy to organize in our plastic boxes and bins with aluminium dividers. Pick-up van conversion with utility body installed to replace the vehicle van body. The pick-up truck can be equipped with shelving, drawers and automotive-class steel modules according to working requirements. 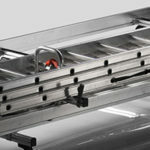 Our fittings are highly customisable to meet every cargo transport need, so when the interior space is not enough, you can take advantage of your van’s available roof space, choosing from a variety of roof rack, tube holder and ladder rack configurations. Store Van has an array of van accessories to round off your interior equipment and make your work days even more productive. You can choose from handwashing kits, jerry can or extinguisher holders, first aid kits, hooks, cable saddles, folding work benches and much more!